Hi hi HI, friends! Holidays have happened in the space between Sticky Gingerbread Cake and now. First came Thanksgiving and then came the annual grocery famine that always happens post-holiday. groceries after Thanksgiving because we spent all our money on a ridiculous lot of food that was (of course) leftover after the fact and good sense says that you have to eat the leftovers till they're gone and then you buy more food. Of course in preparation for the weekend we bought enough flour, butter, and sugar to feed several armies so when you really aren't into any more servings of the disappointingly bland broccoli-cheddar casserole that is usually so delicious, you can whip up something delicious out of the regal three. My friend Ashley says that she feels nervous and cranky if she runs out of either of those three ingredients, and I have to say that I agree - regardless of how empty the fridge might be, if you've got butter, flour, and sugar you have access to something magical. I initially created this chocolate and pomegranate tart to amuse myself on my first free afternoon in what felt like months. I grabbed stuff to make several baking projects I'd kept my eyes on (including this yummy star bread which turns out just as beautiful as the recipe shows!) and went to town and out of that mad afternoon spent bashing around the kitchen, came up with a chocolate pomegranate tart that enough people asked about after seeing it on Instagram to warrant sharing the recipe here. After retesting (awwww do I have to?) I can bring you a recipe that makes me confident that your results will turn out just as beautifully. It is fun to see how many different way this tart can be finished and decorated too! So if this chocolate pomegranate tart was a character from classic British literature, I've already decided it would be Col. Brandon: understated but emotional, classy, composed, and ever so slightly exotic. Fight me on this. 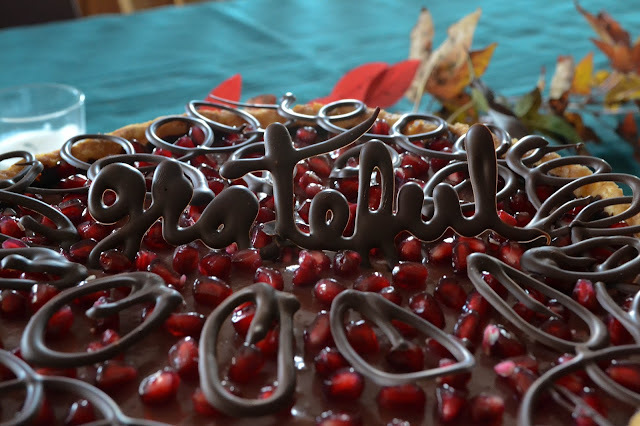 If it's a little extra to write words like "grateful" on your pie, then I'm entirely superfluous. Happy Thanksgiving (again), fam! 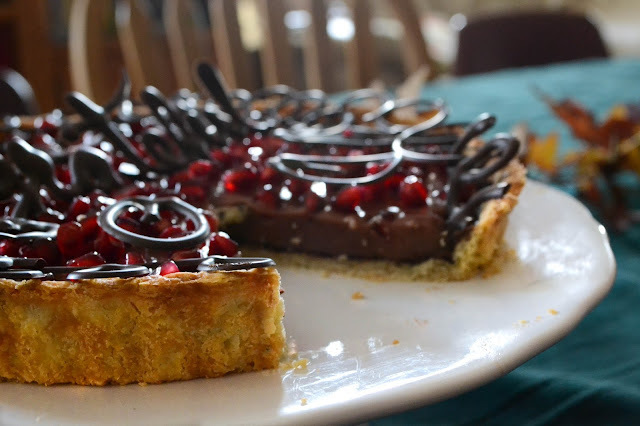 Look out soon for the this chocolate pomegranate curd tart on the blog. Enough of you wanted to see the recipe that it necessitated a remake! The perfect tart shell actually comes from this recipe by Preppy Kitchen. After testing that shell out with Ashley during a dinner party baking day recently, I immediately thought of it for use in my chocolate pom tart. As the preppy kitcheners say, you'll be worried that your pastry won't come together but never fear - it will! In addition to borrowing the pastry from Preppy Kitchen, I slightly altered the pomegranate curd recipe from Parsley Sage Sweet to better fit the ingredients I had on hand. These two components combined with melted chocolate brushed into the crust before filling, fresh pomegranate arils, and some chocolate swirls to top it off create a terribly delicious dessert that also happens to be as fun to create as it is beautiful. The only unusual piece of equipment required to accomplish this party trick is a false-bottomed tart tin so that you can successfully remove the sides from your finished dessert. We only just got a tart tin this summer but I already have used it far more than I use our regular pie pans. There's just something about a tart that appeals to my higher sentiments. This recipe does use seven egg yolks so be sure to save your egg whites carefully for macarons, meringues, or a frittata! for pastry: in small bowl whisk together egg yolks and cream. In a food processor pulse together flour, butter, sugar, and salt until it's roughly pea-sized. While machine is running (if possible) drizzle in cream and pulse till the mixture just comes together. On a well-floured surface knead the dough together about five times till it magically comes together. I promise. Form the dough into a disk and chill for at least thirty minutes. Roll out between sheets of parchment paper, then press into a well-greased tart pan. Prick the bottom all over with a fork, then return to the fridge to chill for at least fifteen minutes. Don't skip this step! It's important for a good, strong blind bake. Using pie weights (or weighing down a sheet of parchment paper with dried beans), bake for 8-10 minutes at 425 degrees F. until golden. for curd: whisk egg yolks together with salt in a medium bowl. In a heavy-bottomed saucepan mix together juices, cornstarch, and sugar. Stir and heat over medium heat till just below boiling. Add a small stream of the heated juice into the egg yolks constantly stirring to ensure you don't scramble the yolks. Continue adding juice a little at a time till egg yolks are warmed through, then pour into the pot, stirring constantly until thickened enough the coat the back of the spoon. Remove from heat and strain, then allow to cool. When tart shell is baked, carefully remove from the tin and place on cake stand or plate. You can anchor it with a smear of pomegranate curd if desired. Melt the chocolate and brush a nice layer into the bottom of the tart shell. Allow to set up in the fridge before spooning the pomegranate curd into the chocolate-lined shell. Scatter pomegranate arils over the curd, then return to fridge. You can use the rest of the melted chocolate to create decorations by swirling or piping it onto waxed paper and allowing it to harden in the freezer, then carefully lifting off and onto your tart. I had my heart set on making this over Christmas break. Too late did I realize that getting ahold of POM juice in Germany is no easy feat. So I found myself on Christmas day with all the ingredients save the most crucial one. Normally I would have called it quits, but I was in no mood to give up. So I made an orange juice curd instead. It turned out smashingly. Someday, though, I do hope to make it with an actual pomegranate curd. Small comment on the recipe: you forgot to say when to add the butter to the curd. I figured it out with some googling, but you might want to fix that.